Felix Mendelssohn was born in Hamburg in February 1809 the third of four children in a successful banking family who were also distinguished intellectually and artistically. His family converted from Judaism to the Lutheran church in 1816, and at this point adopted the additional name 'Bartholdy'. The conversion was almost certainly done to gain social acceptance rather than for religious reasons. Felix himself never used the adopted name. In his childhood he studied the piano with Ludwig Berger and theory and composition with Carl Zelter. His talent for both performance and composition was prodigious, and his first surviving compositions date from 1820. Mendelssohn's music is most clearly influenced by Mozart and Beethoven, and his use of form and harmony is rooted in the classical period. His extensive education also brought him in contact with the work of Bach and Handel whose distant influence can be traced in his use of counterpoint. From around 1824 he developed a characteristic style of his own, which places him clearly among the early romantic composers. His piano concertos, similar to those of Chopin, depart from the classical model in increasing the prominence of the soloist. The Piano Concerto in D Minor was written for performance at the Birmingham Festival of 1837. 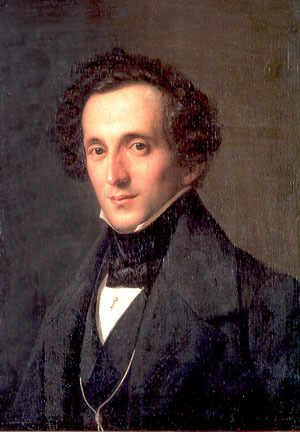 By this time Mendelssohn had gained an international reputation as both a pianist and composer, and was particularly popular in England, where he had been entertained by Queen Victoria and Prince Albert. The festival however came shortly after his marriage to Cécile Jeanrenaud, and consequently it was with some unwillingness that he found himself travelling to Birmingham for the première. The concerto opens unusually with a quiet, almost menacing, dialogue between the soloist and orchestra before the orchestra dramatically introduces the first subject. A mood of darkness and mystery pervades the first movement. The second subject is introduced by the piano, making its way to the relative major key of F. The movement ends with a calmer coda played by the soloist. The slow movement in the key of Bb major is lyrical, even rhapsodic in character. The last movement is lively and brilliant, though with a delicacy and lightness that is typical of the composer.